A mixture of folk and sacred tunes, this CD encompasses a wide range of historical time periods, though many are well known old folk tunes. Denise had long played old folk tunes on her Dulcimer. 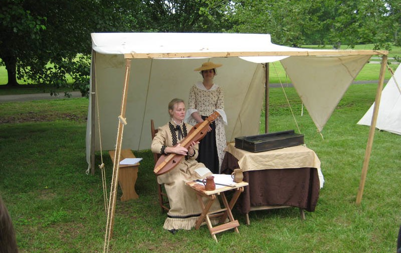 Whether for reenactments or for Dulcimer club, these old standards are a foundation for Dulcimer players. Diana, on the other hand, didn’t have much experience singing in this style. After working together on a CD project called “Music in Middle Tennessee 1790-1800- Mansker’s Station”, they both started to look into doing some recording of their own. Some of the songs they pulled from their previous work on the Mansker’s project, such as “Barbary Allen” and “Johnny Has Gone for a Soldier”. The hymn tunes were already well known to both musicians, though “Be Still My Soul” would be new to both. 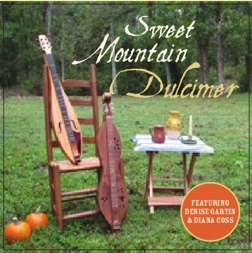 Diana had a particular fondness for this piece since it is based on the beautiful “Finlandia” tune; this track would be the only one on which Diana would play Dulcimer. Though an eclectic mix of songs, because of the use of only Dulcimer and voice the overall feel is of early period folk music.